People would not find this kind of matchboxes unfamiliar. It is an item you would find at home easily when we were still teenagers, especially in Hong Kong. When you are bored, you would just light up a match and watch the flame dancing in the air. The above is certainly our good “old” memory. 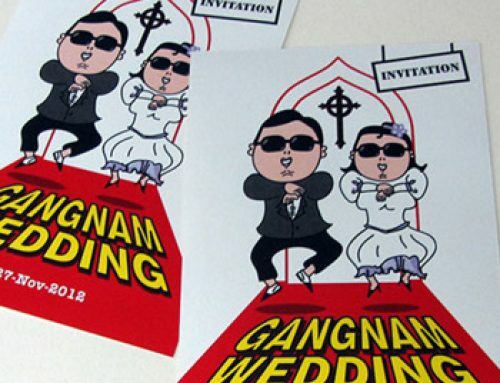 It will be interesting if this memory can be blended with a wedding invitation design. 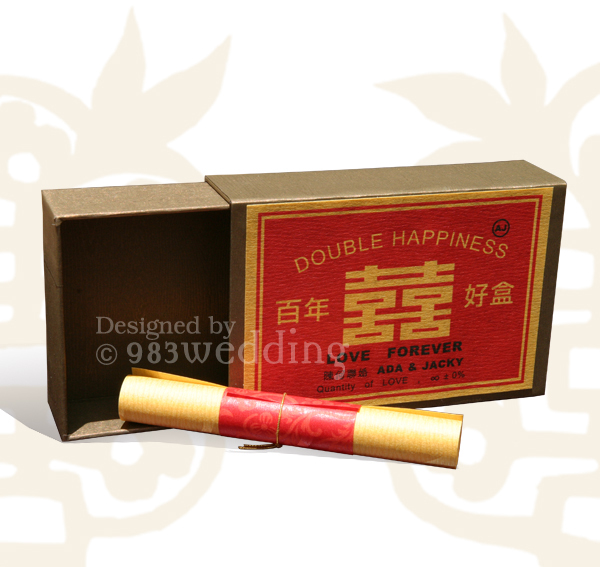 A prominent graphic element we can see on this “vintage” matchbox is the “Double Happiness” symbol on it. 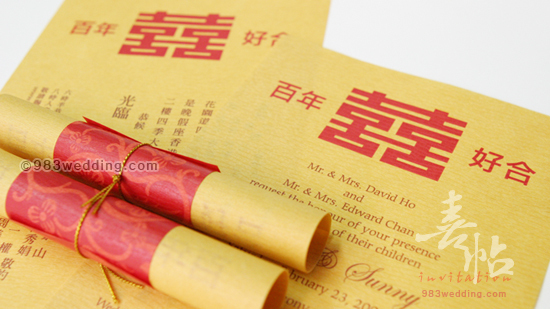 As you will know, this symbol is usually used as a blessing for the wedding. 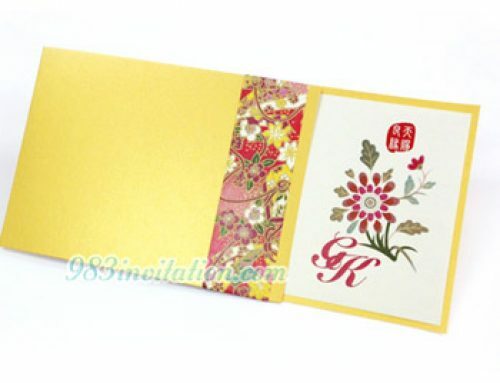 It is widely used when designing Chinese wedding invitations. 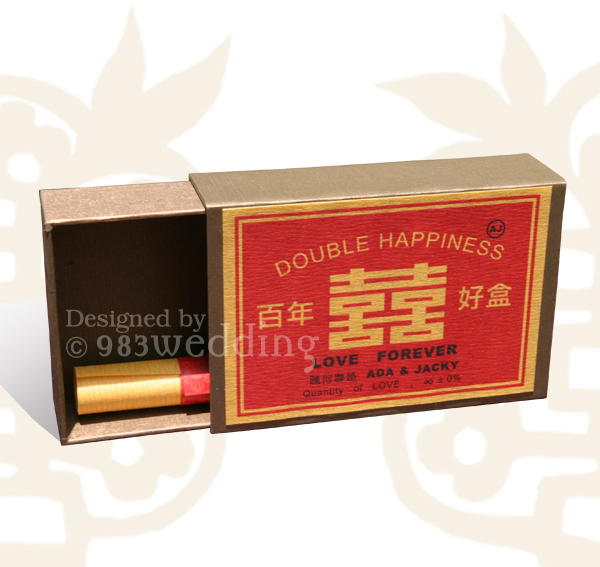 As a result, it will be quite natural to transform this small matchbox into a wedding invitation design. For this particular design, we try to reproduce our memories. 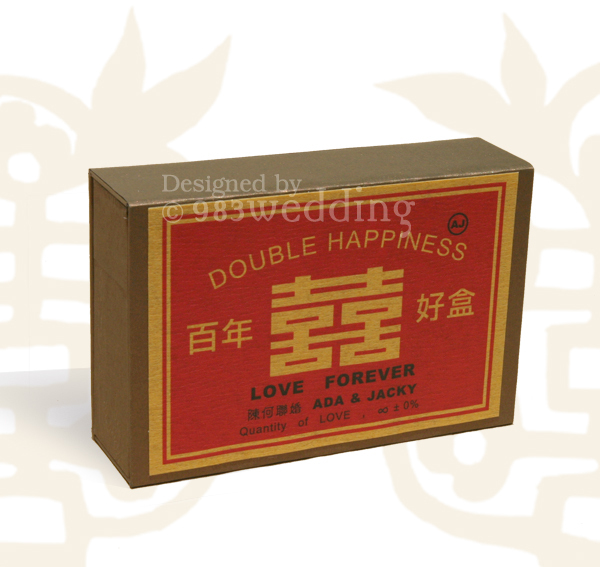 The Design idea of this wedding invitation is really from our memories in our teenage, and to reassemble the matchboxes in our era. The main idea is to create a “mega-ature” of the original matchbox. The original size of the original box is very small, which is not really suitable for an invitation. Consequently, it will be a must to enlarge it so as to enable that it can carry all the information of your wedding. 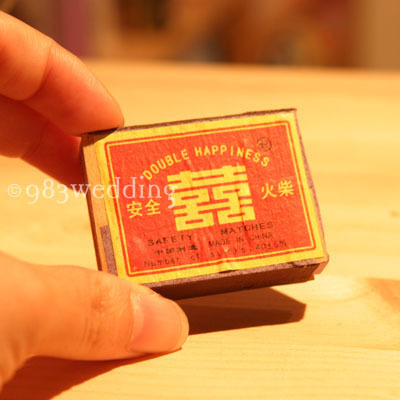 This matchbox wedding invitation is named after “Bak Nin Hou Hap” (“百年好盒”; or Bai Nian Hao He in Mandarin Chinese) because of the same pronunciation of “百年好合”. It is a blessing for couples to be in love for hundred years, which virtually means forever. The four Chinese characters “百年好盒” are printed on the design. As discussed, “百年好盒” read the same as “百年好合”. The character “盒” means a box. So, we try to blend two ideas together with these four words. First of all, we try to express a blessing to the couple. At the same time, these four words can mean a box which contains all the good blessing within. The box will act as a container for the actual invitation information. Depending on the amount of information you need to tell your guests, you can put up to five to size pieces of paper rolls into the box. You may ask why paper rolls. This is to imitate the notion of matches in the box. 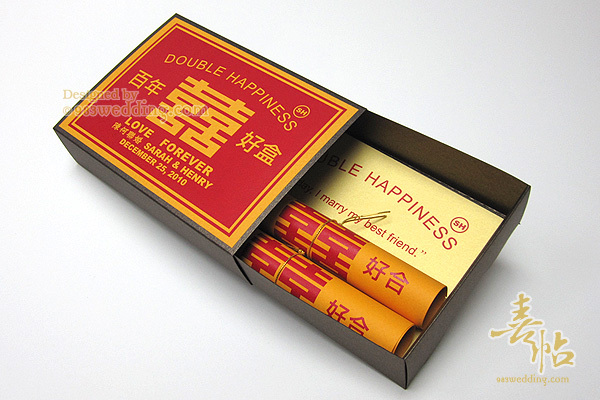 In order to make it a whole set of unique design, the same double happiness character and “百年好盒” will also be printed on these paper rolls. A Small detail does make an enormous difference. 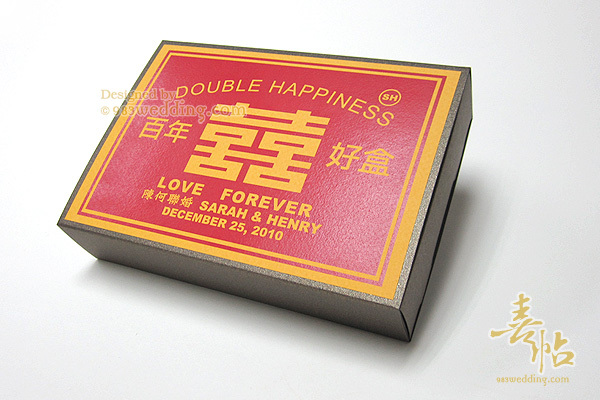 This is a simplified version of the Matchbox which allows you to mail the invitation in an easier way. 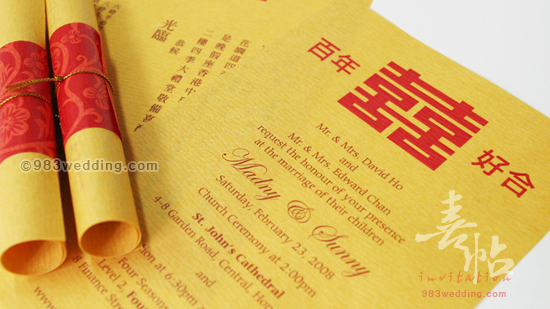 Yellowish texture paper with 2 color printing. 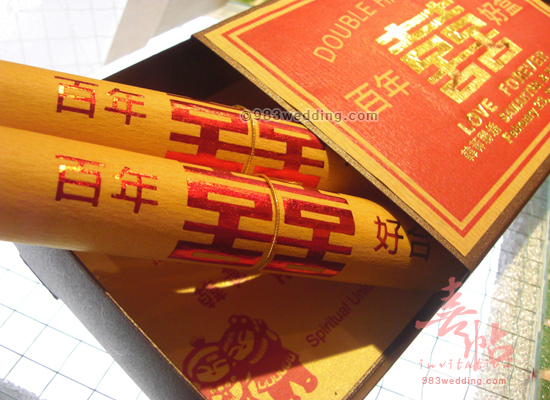 Roll up and tie with red paper strip and gold color string to symbolize a match. 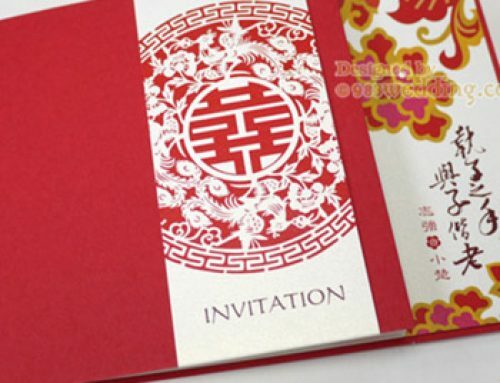 Cover with red color hot stamping (foil printing) on red color paper. 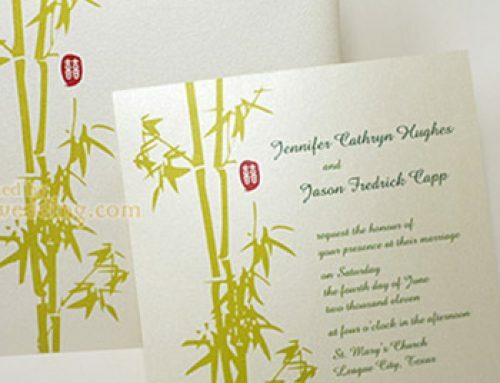 Insert with two color hot stamping in rolls. 1. R.S.V.P. 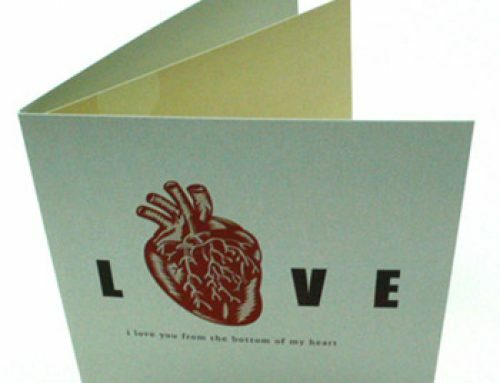 card, place card, menu, church program & thank you card would be ordered with the same design. They will be put into the box. 2. Return address would be printed on R.S.V.P. envelopes on request.